VANCOUVER, Nov. 12, 2018 /CNW/ - InMed Pharmaceuticals Inc. ("InMed" or the "Company") (TSX:IN; OTCQX:IMLFF), a fully integrated, cannabinoid-based biopharmaceutical company that leverages its proprietary platform technologies to develop novel therapeutics for the treatment of diseases with high unmet medical needs, today reported financial results for the three months ended September 30, 2018, which is the Company's first quarter of fiscal year 2019 ("1Q19"). The Company's full financial statements and related MD&A for the three months ended September 30, 2018 will be available at www.sedar.com on November 12, 2018. "We continued to make solid progress on our operating strategy during 1Q19, which is, first and foremost, diligent execution with our leading R&D programs" stated President and Chief Executive Officer, Eric A. Adams. 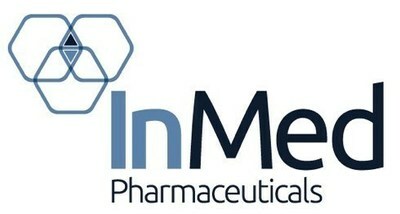 Mr. Adams continued, "During the quarter, we made considerable advancements with our INM-750 program for the treatment of Epidermolysis Bullosa, and we currently believe that we remain on track to begin discussions of our clinical development plans with regulatory authorities in the first half of 2019 and for a CTA/IND filing for INM-750 in the second half of 2019." "Specifically, within our INM-750 program," Mr. Adams continued, "among many other pre-clinical studies, we conducted drug permeation studies on several formulation variations. In these studies, with our selected formulation, we demonstrated good drug penetration and adequate drug concentrations in the epidermis, which is the target tissue for INM-750. In addition, and very importantly, we have demonstrated that the cannabinoid components in the INM-750 formulation each play important, and independent, functions for various target effects, including anti-inflammation and keratin upregulation." "Concerning our ongoing work in toxicology and pharmacology, we completed two types of genotoxicity studies, which demonstrated no mutagenicity with the cannabinoid components of INM-750. In addition, we completed two 7-day dose range finding and pharmacokinetic studies for assessment of systemic toxicity. The lack of any negative results from these studies support continued development of INM-750," added Mr. Adams. "During 1Q19," Mr. Adams continued, "we also made meaningful strides to advance our proprietary biosynthesis manufacturing technology. In particular, we announced entering into a service agreement with the National Research Council Canada (NRC) in Montreal, Canada in October, for bio-fermentation development and scale-up processes for cannabinoid biosynthesis in E. coli. Since then, we have initiated our technology transfer from our partners at The University of British Columbia (UBC) to the NRC. This collaboration moves us one step closer to achieving our ambition of being able to produce multiple pharmaceutical-grade cannabinoids on a commercial scale." Mr. Adams continued, "In addition, I'd like to reiterate a material development in strengthening our IP portfolio. Specifically, we successfully converted our provisional patent to a PCT patent filing for 'Metabolic Engineering of bacterium E. coli for cannabinoid products'. We also announced that our research partner at UBC received a grant from the prestigious Natural Sciences and Engineering Research Council of Canada (NSERC) for our collaborative efforts in the biosynthesis of cannabinoids," concluded Mr. Adams. For 1Q19, the Company recorded a comprehensive net loss of $2.8 million, or $0.02 per share, compared with a comprehensive net loss of $1.8 million, or $0.01 per share, for the three months ended September 30, 2017 ("1Q18"). The primary reason for the increase in the comprehensive net loss in 1Q19 compared to 1Q18 in fiscal year 2018 was an increase in non-cash, share-based payments, in connection with the grant of stock options, which was $1.4 million for 1Q19, compared with $0.6 million for 1Q18, with the increase attributable to stock options granted during the second half of fiscal 2018. Research and development expenses were $0.63 million for 1Q19, compared with $0.38 million for the three months ended September 30, 2017. The increase in research and development expenses in 1Q19 as compared to 1Q18 was primarily due to increased spending with external contractors for work associated with preclinical studies and formulation work for INM-750 together with increased spending on the Company's biosynthesis program, as well as higher R&D personnel compensation as a result of increased R&D staffing. The Company incurred general and administrative expenses of $0.81 million for 1Q19, compared with $0.84 million for the three months ended September 30, 2017. The decrease in general and administrative expenses in 1Q19 as compared to 1Q18 was primarily due to decreased spending on investor relations activities that more than offset increased personnel compensation that reflects increased staffing, reflective of the growth in the Company's operations. At September 30, 2018, the Company's cash, cash equivalents and short-term investments were $24.8 million, which compares to $26.5 million at June 30, 2018. During 1Q19, the Company's cash, cash equivalents and short-term investments decreased by $1.7 million, which resulted primarily from cash outflows from operating activities. At September 30, 2018, the Company's total issued and outstanding shares were 170,883,633. Including outstanding stock options and warrants, as at September 30, 2018, the Company had 221,291,290 shares on a fully diluted basis. During 1Q19, the weighted average number of common shares was 170,856,278, which is used for the calculation of loss per share. The Company's full financial statements and related MD&A for the quarter ended September 30, 2018 are available at www.sedar.com. This news release contains "forward-looking information" and "forward-looking statements" (collectively, "forward-looking information") within the meaning of applicable securities laws. Forward-looking information is based on management's current expectations and beliefs and is subject to a number of risks and uncertainties that could cause actual results to differ materially from those described in the forward-looking statements. Forward-looking information in this news release includes statements about: developing novel therapies for the treatment of important diseases with high unmet medical needs; beginning discussions of our clinical development plans with regulatory authorities in the first half of 2019, with a CTA/IND filing for INM-750 in the second half of 2019; being able to produce multiple pharmaceutical-grade cannabinoids on a commercial scale; the potential of INM-750 as a therapy in EB and for other potential dermatological and wound-healing applications; and the expected fundamental value drivers of the Company.